If you’re looking for a really rustic, informal feel to your day, you could consider offering handmade wood-fired pizzas to your guests. Usually brides and grooms opt for this as an evening food option and it goes down a storm. 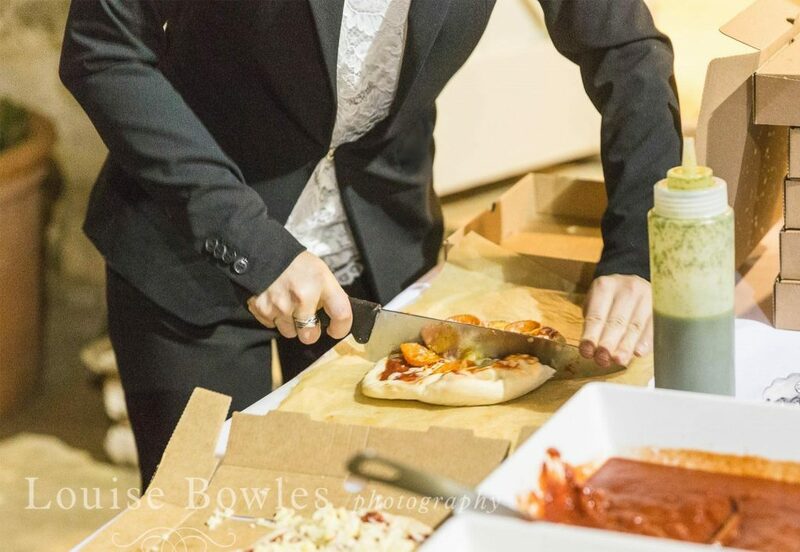 We work at some wedding venues that have a pizza oven in situ, however if you really want to get the experience outside your marquee you can hire wood-fired pizza ovens (or we can help you organise hiring one) and then the chefs can cook live in front of your guests. People get the sounds and the smells and the theatre of the cooking, before enjoying the delicious end product. Now this isn’t a new concept, people have been enjoying hog roasts at weddings for a long time. But have you considered it as a main meal? You’re probably thinking a hog roast is just pork meat in a bun with stuffing and apple sauce, held in a napkin, right? Well, it is in some cases. But you can go for a very different option. A formal hog roast involves the pig being slow roasted on a spit and then carved by the chef. The delicious, and meltingly soft meat, is brought to the tables on boards, banqueting style for guests to share and serve themselves. This is served with a range of accompaniments, such as salads, rosemary and garlic roasted new potatoes, homemade coleslaw, apple sauce, and fresh crusty bread. It makes for a very convivial dining experience – and well suited to being in a marquee looking out at the green grass. You needn’t stop your theme at the wedding food, why not extend it to the drinks too? Some simple tweaks can make the drinks service look incredibly special. Take a look at these two ideas. 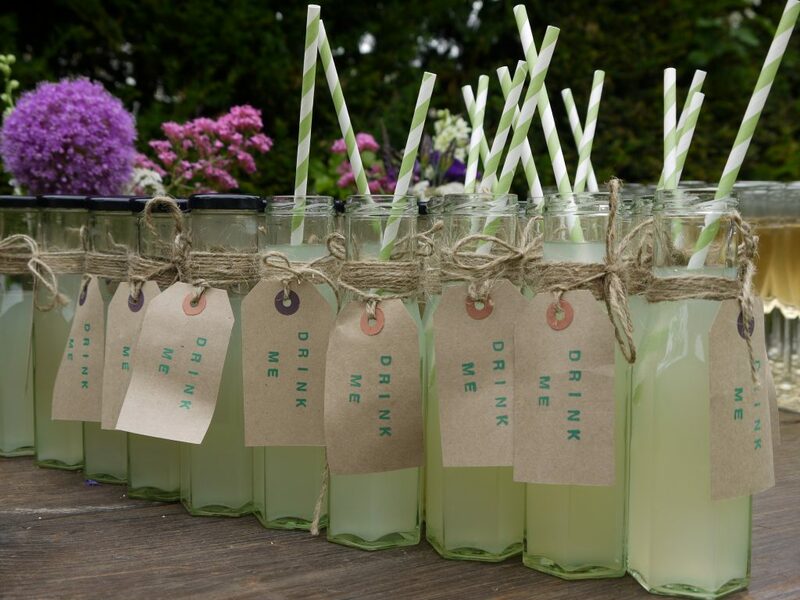 At one wedding, we provided traditional lemonade in mini milk bottles as the non-alcoholic drink option, topped off with cute straws and rustic luggage labels tied on with twine. 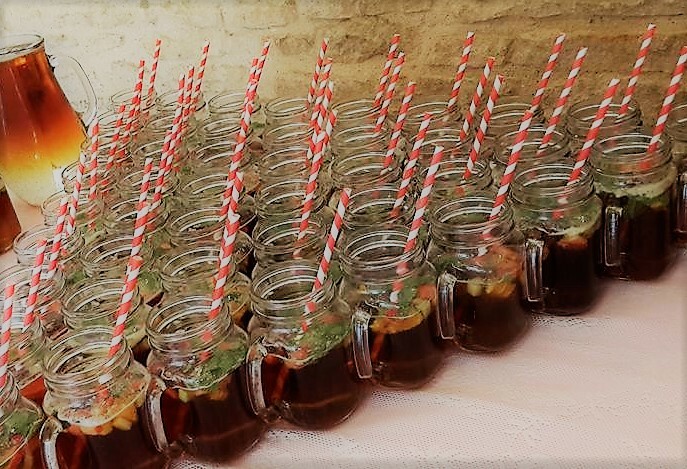 The second photo is of Pimms served in jam jar glasses with handles. You can do a wide range of drinks in all sorts of fun and rustic containers. It all adds to the theme of the day. 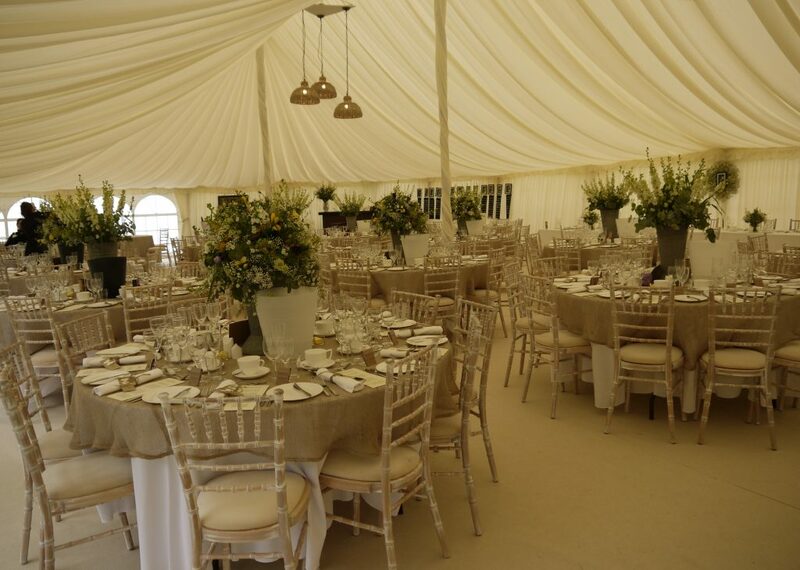 And whilst we’re at it, we just love the table dressing at this beautiful white and hessian themed marquee wedding we catered for, so simple and rustic, yet so chic! This is a bit of a classic, but there is nothing like a good afternoon tea on a beautiful day, sat looking out on the countryside – the two go hand-in-hand. In our opinion you simply have to have some scones with clotted cream and jam – but outside of that it can be anything you want, you can customize to your hearts content. Some people theme it around their wedding colours, others goes classic with mini sandwiches and beautiful dainty cakes - all served up on tea-stands, which again you can choose from classic, or vintage. If served the English way, with proper cups of tea, you’re sure to please all of your guests, young and old.Hopefully that’s given you a bit of inspiration, but for more menu ideas why not take a look at our sample menus here. 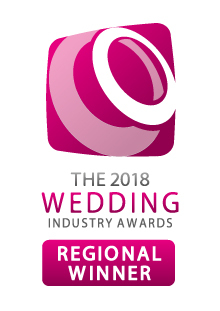 Also visit our Facebook and Twitter pages for wedding ideas, or check out our Pinterest boards for plenty of wedding inspiration.